The shift to high pixel density displays, which started with smartphones and tablets, has spread to the world of PC display monitors. 4K displays for PCs hit the shelves in 2014, and an understanding of pixel density has become important for selecting products, along with screen size and resolution. Our theme this time is the shift to high pixel density displays, including trends in the latest technology. Looking at the market trends in LCD monitors for PCs, in the latter half of the 2000s, the transition from square to wide screens took off all at once, and currently, the trend has been towards larger screens and higher resolutions. In this article, we take a look at the relationship between resolution and screen size along with pixel density and the latest trends in technology. Note: This is a translation from Japanese of the ITmedia article "ITmedia LCD Monitor Course III: Confused about HiDPI and Retina display? Understanding pixel density, an essential element in choosing displays in the age of 4K" published on December 11, 2014. Copyright 2014 ITmedia Inc. All Rights Reserved. Over the next several years, it is predicted that 4K will replace full HD as the mainstream resolution. 4K, of course, represents 4,000 and refers to a horizontal pixel count of around that number. There are currently two standards for 4K resolution, namely "DCI 4K" and "UHD 4K. 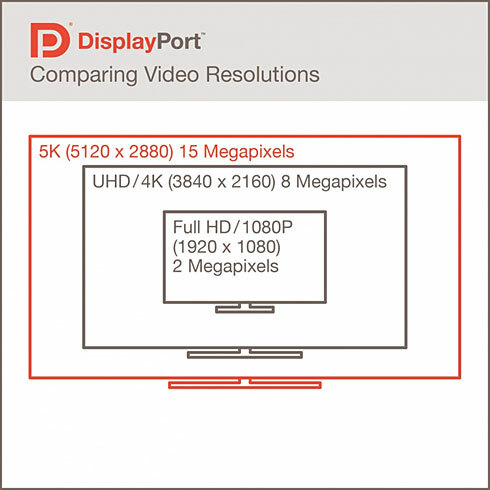 DCI 4K is twice the 2048 x 1080 pixel resolution of projectors (4096 x 2160/approx. 17:9) and is the 4K resolution of the film industry. UHD 4K (also called UHDTV 4K), on the other hand, is the 4K resolution of the television industry defined by the International Telecommunication Union (ITU). It has twice the horizontal resolution of 1920 x 1080 pixel full HD (3840 x 2160/16:9). 4K displays for current PCs are primarily UHD 4K resolution like 4K televisions. However, there are a few products out there that have adopted the DCI 4K standard, such as the ColorEdge CG318-4K color management monitor for video production to be released by EIZO in the spring of 2015. 4K is a high resolution with twice the vertical and horizontal pixel count of full HD and refers to resolutions featuring a horizontal pixel count of around 4 million. 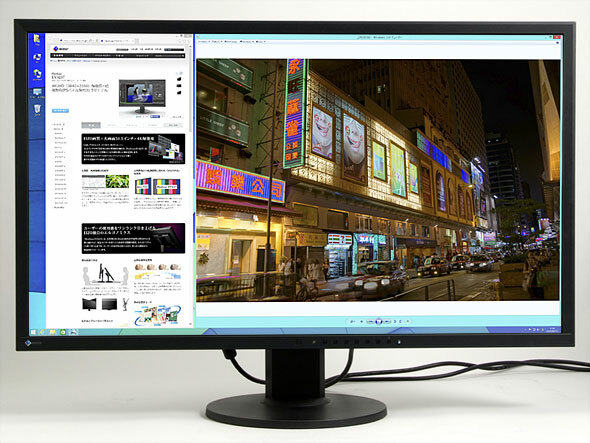 The photograph is of EIZO's ColorEdge CG318-4K. It supports 4096 x 2160 pixel/approx. 17:9 display, which surpasses the 3840 x 2160 pixel/16:9 (UHD 4K) display often used in 4K displays for PCs. Note the difference in horizontal resolution. At the same time, the 4K display environment is still in a transition period, so there are several things that should be noted, the first of which is the refresh rate issue. The only interface for 4K displays currently on the market that is capable of 4K 60 Hz display is DisplayPort 1.2, which has a 21.6 Gbps bandwidth. That’s because 4K 60 Hz transmission requires a bandwidth of 16 Gbps (3840 x 2160 pixel, 32-bit color, 60 Hz). This is well above the bandwidth supported by DisplayPort 1.1 (10.8 Gbps), HDMI 1.4a (10.2 Gbps) and DVI Dual Link (7.4 Gbps). For that reason it should be noted that currently, when connected via DVI-D or HDMI, 4K display only works at 30 Hz. However, as far as HDMI goes, the bandwidth of the new HDMI 2.0 standard (HDMI 2.0 Level A) has been expanded to 18 Gbps, and new displays capable of 4K 60 Hz display with HDMI 2.0 input have been announced. As the video output components of PCs (GPU) and other devices begin supporting HDMI 2.0, the situation will gradually improve. From left to right: DVI-D, HDMI and DisplayPort video input terminals. 4K 60 Hz display requires connection via DisplayPort 1.2. Dual Link DVI-D and the current HDMI 1.4a only support 4K display at 30 Hz. If the display is connected via DisplayPort 1.2, the setting can be changed to 4K 60 Hz display in the OS settings. 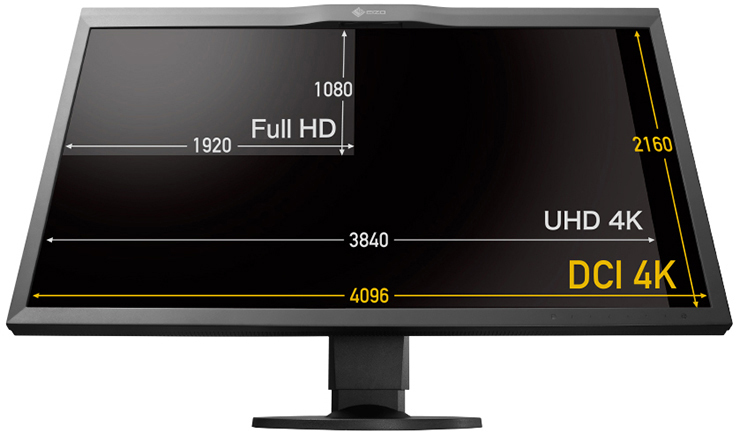 The above image shows the setting for 4K 60 Hz with EIZO's FlexScan EV3237 31.5" 4K display. The HDMI 2.0 Level B standard is capable of transmitting 4K 60Hz signals over the HDMI 1.4 transmission bandwidth, but the color depth is YUV 4:2:0, and colors bleed, so it is not suited to displays. We’ll have to wait for the spread of HDMI 2.0 Level A for proper 4K 60Hz display via HDMI. Moreover, there are cases where the 60 Hz transmission system of the 4K display creates problems even if DisplayPort 1.2 is used. Although not widely known, there are two transmission systems used to support 60 Hz display with the currently available 4K displays, namely MST (Multi Stream Transport) and SST (Single Stream Transport). In the MST system, the OS recognizes 4K as a two-screen 1920 x 2160 pixel display, so a GPU driver is required to combine the output onto one screen. Depending on the version of the GPU and driver used, there were problems such as with the rendering timing on the left and right sides of the screen or not working in a multi-display environment. The reason the video signal is purposefully split into two screens for transmission is that the supply of display scalers (video processing chips) that can transmit 4K 60 Hz as a single screen was behind the supply of 4K LCD panels. For that reason, there was no other choice but for the early 4K displays to adopt the MST system. In contrast, the SST (Single Stream Transport) system can transmit 4K resolution as a single screen, so it is capable of 4K 60 Hz display without internal image synthesis or other processes. It does not have problems resulting from splitting the signal into two screens like MST, but there are some devices with DisplayPort 1.2 that have graphics cards that do not support SST, so the card should be checked at the time of purchase to see if it supports SST. Incidentally, EIZO's FlexScan EV3237 31.5" 4K display has adopted the SST system. These kinds of compatibility issues will likely be solved in the not-so-distant future as 4K displays become more popular and support improves on the GPU and driver side. Of course, these limitations only apply to 4K display at 60 Hz, so if you're satisfied with 30Hz, the current HDMI 1.4a and DVI Dual Link are fully capable of 4K display. The shift to high resolution displays does not stop with 4K. 27" displays (5120 x 2880 pixel/16:9) that support 5K are already being commercialized. The question is what will the very high resolution of 5K be used for, but there is the advantage that tool bars and other elements can be placed on the screen while displaying 4K content with video editing software. However, the current DisplayPort 1.2 does not support 5K output, so it should be noted that as of right now 5K displays require special configuration to send video signals via two cables. Although not yet commercialized, the new DisplayPort 1.3 standard announced in September 2014 supports 5K (5120 x 2880 pixel) 60 Hz display and simultaneous two-screen UHD 4K display via daisy chain. Once PCs (GPUs) with DisplayPort 1.3 support hit the shelves, 5K 60 Hz signal output will be possible with a single cable. DisplayPort 1.3 makes 5K (5120 x 2880 pixel) 60 Hz display possible with a single cable. *Source: Presentation by VESA (Video Electronics Standards Association), which is the standardization body for PC graphics-related devices. What's more, the world of 8K to follow 4K and 5K is almost here. According to an announcement by the Japanese Ministry of Internal Affairs and Communications, 8K test broadcasts will begin in 2016 and regular broadcasts in 2018. 8K (7680 x 4320 pixel/16:9) compatible display test models have appeared at video-related exhibitions and events, and the move towards ever higher resolution and higher definition will continue at a rapid pace. As the resolution of displays grows increasingly higher, a new element to consider when choosing a display today is pixel density. Pixel density in displays is a spec indicating the degree of definition, and the value is usually expressed in ppi. Ppi stands for "pixes per inch" (not per square inch). An inch is equal to 2.54 centimeters. Reducing the distance between pixels (pixel pitch) without changing the screen size of the LCD increases the ppi, and the higher this number, the higher the definition of the display. For example, at 100 ppi, there are 100 pixels per 2.54 centimeters, and at 300 ppi, there are 300 pixels packed within the same width. 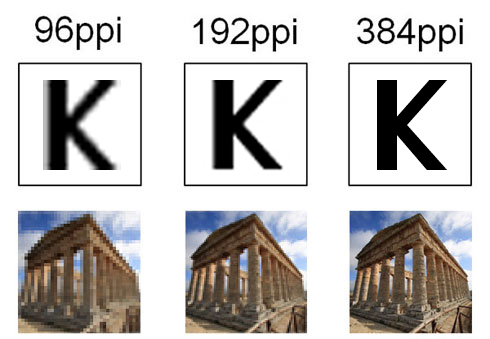 Different pixel densities create differences in appearance. The image on top is of an enlarged 10pt font, and the image below is an enlarged thumbnail of a photograph. At 96 ppi, the roughness of the pixels is apparent, but at 192 ppi, the quality is greatly improved. At 384 ppi, the image is smooth, and the pixel grains and jagged edges of diagonal lines are no longer visible. Today there is a trend of rapidly rising pixel density. Looking at stand-alone displays, the hot topic of late is super high pixel density displays with high resolution of 4K packed into screen sizes of 24-27 inches. At first, this genre only attracted the attention of some high-end consumers, but low-priced products started hitting the shelves one after another in 2014, so the number of regular users showing an interest has increased. What people need to know before choosing one of these super high pixel density displays is the new way of thinking concerning resolution that has been brought about by rapid increases in pixel density. When it comes to PC displays, most products have a pixel density of about 96 ppi to match the display density of 96 dpi (dots per inch) which has been the standard for the Windows desktop UI. The standard for the new Start screen and other aspects of the Modern UI of Windows 8 and later is 135 dpi (automatically switching between 100%, 140% and 180% depending on the pixel density of the display device), but the standard for the desktop UI is still 96 dpi. As such, up until now, PC displays have been designed based on the assumption that the OS and applications would have a fixed display density (96 ppi for Windows). The 96 dpi standard is behind this assumption, and the screen size increased with the higher resolution of LCD panels (increased pixel counts), so it was safe to simply consider that the higher the resolution (pixel count), the larger the work space. The higher the pixel density of the display, the higher the definition of the OS and applications, but there was no such thing as a display with such high pixel density that it could not be put to practical use, so it did not lead to any major problems. Depending on how high the pixel density, the icons and fonts would appear larger or smaller, but the definition was sufficient for the users to recognize them. This is the conventional thinking with regards to LCDs. The screen size increased as the resolution of LCD panels became higher, so choosing a display with a higher resolution meant that the amount of information displayed at once was higher and the work space was larger. On the left is an SXGA 17" square screen (1280 x 1024 pixels), and on the right is a WUXGA 24.1" wide screen (1920 x 1200 pixels). As you can see, the higher resolution and larger screen provided a much larger work space. By contrast, when it comes to super high pixel density displays of the 4K class, a higher resolution (pixel count) does not necessarily mean a larger work space. In recent years, the display density (dpi) of the Modern UI, OS and applications in Windows 8 and later is designed to be variable rather than fixed. In other words, even at the same screen size, the display density does not have to be fixed. With the scaling function of the OS, the display can be enlarged smoothly. The biggest advantage of this is that it enables very high definition display. Say, for example, you took a 24" UHD 4K display and enlarged the display so that the work space was equivalent to 24" full HD. UHD 4K (3840 x 2160 pixels) has twice the vertical and horizontal resolution of full HD (1920 x 1080 pixels), so there will be scaling of 200% for the enlarged display. A single pixel on the OS display that was conventionally displayed using one pixel on the LCD panel is rendered with four pixels (double the aspect ratio), so combined with the OS-side scaling function, it produces a very fine and smooth display. 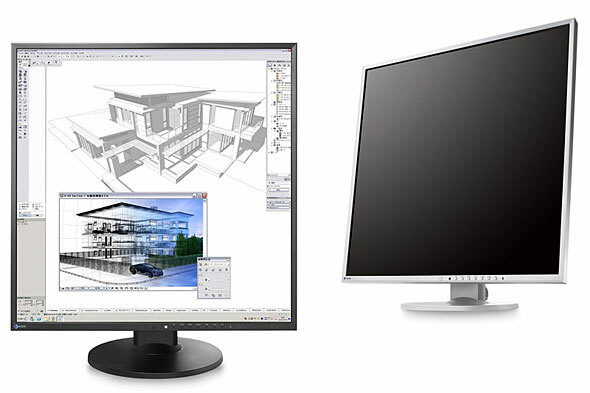 EIZO's FlexScan EV3237 31.5" display supports UHD 4K display. For a large external display, it has high pixel density (approx. 140 ppi) for smooth, very high-definition display. This product has a large 31.5" screen, so it also offers a large work space, but with 23.8" and 28" 4K displays, the display is too fine, so the scaling function of the OS has to be used to enlarge it. This is the difference in how UHD 4K (left) and full HD (right) appear at the same screen size. The photographs of the icons have been taken at about the same distance from the screen. With UHD 4K (3840 x 2160 pixels), the display is enlarged 200%, and with full HD (1920 x 1080 pixels), the icon is displayed at the same magnification. The size of the icons is roughly the same, but as you can see, the icon is displayed in higher definition with UHD 4K. It's difficult to describe, but if you compare the display on smartphones, on which high pixel density display is common, with that of conventional low pixel density PC displays, you'll be able to see the advantage right away. Compared to the sharp and smooth display on the smartphone, the display on the PC appears rough, and the pixel grid is visible. Moreover, the diagonal lines may appear jagged, and the rendering of text and icons may have a rough feel. If you use a smartphone or tablet frequently, you might have even felt that something was wrong with the display on your PC. With the 4K class of super high pixel density displays, the smooth display quality of smartphones can be achieved. And because it's not on a small screen like that of a smartphone but a precise rendering across the large screen of a PC display, many people are probably surprised at the high picture quality when they actually see it. In actual usage scenarios, there are various advantages, such as ease of discerning focus and blurring when retouching high pixel photographs without enlarging or shrinking them, improved visibility of text, numbers and fine details of illustrations in design and CAD software, and legibility of fine text and clear distinction between fonts in PDFs, digital books, etc., so it can be expected to contribute to improved work efficiency. Of course, the enlarged display of the full HD-equivalent work space on the 24" 4K display introduced above is only a single example. If you want a large work space even if the icons and text are a little smaller, you just have to lower the magnification. On the other hand, if you want to have a larger display with improved visibility even if the work space is smaller, you just have to increase the magnification. This flexibility is another thing that gives super high pixel density displays an advantage. This is the difference in appearance produced by the scaling setting on the FlexScan EV3237 (31.5"/3840 x 2160 pixels/approx. 140 ppi). The image on the left is of normal 100% magnification, and the image on the right is of enlarged 150% magnification. This is an example of screen display on the FlexScan EV3237 desktop. At 100% magnification, the 3840 x 2160 pixel UHD 4K resolution can be fully utilized, but the pixel density is around 140 ppi, and the pixel pitch is about 0.18 mm, so it appears quite tiny from the normal viewing distance (left). When magnification is set to 150%, the work space becomes smaller, but the visibility of the text and icons is improved (right). Nevertheless, it should be remembered that there are practical limitations to lowering the magnification rate for scaling to make a larger work space on a super high pixel density display. For example, if a small screen size like 24" is selected for a 4K display as described above, the scaling magnification rate has to be raised to ensure visibility. As a result, you can't have a large work space with respect to the actual resolution. By reducing the distance from which the screen is viewed, it may be visible even if you lower the scaling magnification rate a little. However, if you get too close to the display, your eyes and neck will have to make bigger movements during use, which will increase the burden on your body, so this is not recommended. Of course, the larger the screen size the more room you'll have for making adjustments to the work space and scaling magnification rate, so if you're not sure, choose a super high pixel density display that is slightly larger than your current one, and you should be able to create a comfortable environment without trouble (you'll need to pay attention to the physical space required by the display, though). On the left is the FlexScan EV3237 (31.5"/3840 x 2160 pixels/approx. 140 ppi), and on the right is the FlexScan EV2436W (24.1"/1920 x 1200 pixels/approx. 94 ppi). When the scaling on the FlexScan EV3237 is set to 150％ magnification, the appearance of the text and icons is about the same as on the FlexScan EV2436W at normal magnification. The appearance is close to the Windows Desktop UI standard of around 96 dpi, so the setting provides a balance between definition and work space. Even at 150％ magnification, taking advantage of the 31.5" wide screen, you can secure a large work space. Support for the high pixel density display environment in the PC OS is called HiDPI support. Along with support on the OS side, support by applications is also progressing, and the PC software environment surrounding HiDPI has risen to a practical level. 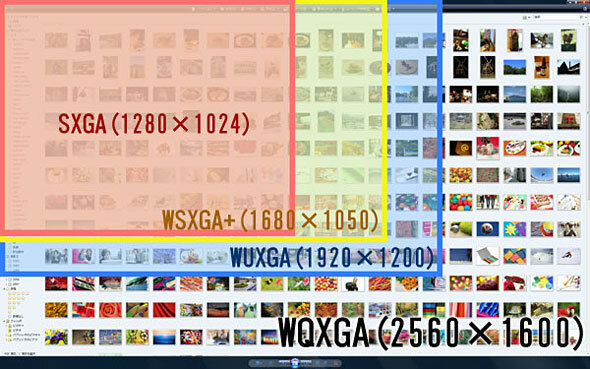 This is boosting the spread of super high pixel density displays like 4K. As far as the Windows OS goes, the display density has been a modifiable setting since Windows XP, but it would sometimes jumble screen layout, and there were almost no applications that supported it, so it was not a practical feature. The scaling magnification function reached a practical level where the screen layout did not break down as of Windows 7. 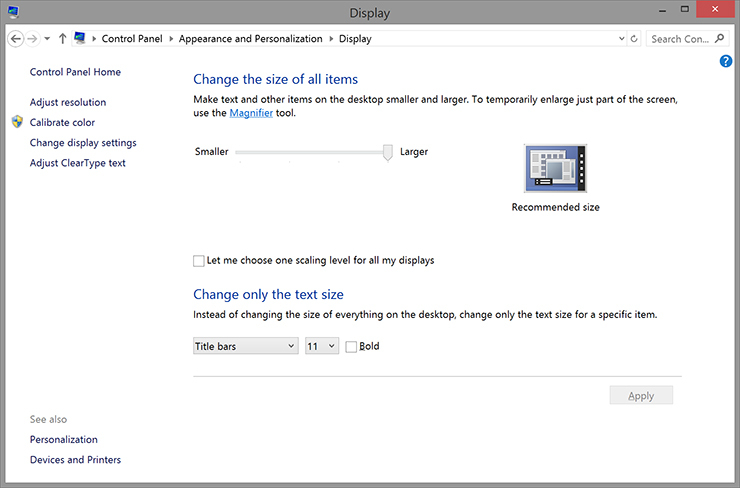 Moreover, since Windows 8.1, it is possible to apply different display density settings to different displays when multiple displays are connected, and the sense of incongruity experienced in a multi-screen environment with displays of different pixel densities has been reduced (however, the number of setting levels is limited, so the combination of display densities cannot be elaborately customized). As for Mac OS X, the spread of high pixel density displays (referred to as "Retina displays" by Apple) was promoted earlier than it was by the Windows camp, so optimization of the OS design with variable display density is further along than it is with Windows. OS X Mavericks 10.9.3 and later support HiDPI display by external displays, so it's easier to combine high pixel density displays made by other companies. This is the Windows 8.1 scaling magnification rate settings screen. With a UHD 4K display, if you set it to "Extra large - 200%," the icons and text will be displayed at the same size as a full HD display with the same screen size. You can also adjust the text size of certain elements rather than changing the size of everything on the desktop. When it comes to applications as well, the Microsoft Office 2013 (Windows)/2011 (Mac) office suite, major web browsers and other applications are starting to support HiDPI one right after another. Image editing software Adobe Photoshop Elements offers support as of Ver.13, and Photoshop CC has provisional support for manually setting 200％, so the foundation for full utilization of high pixel density displays has been laid. As for hardware, lately GPU already has processing performance that could be called overkill for general use, so even PCs that aren't especially high performance should be able to handle 4K display (although enjoying 4K games and videos on them is going to be a different story). For reference purposes, the status of GPU support for EIZO's FlexScan EV3237 31.5" 4K display is summarized in the table below. This trend of high pixel density becoming mainstream took off all at once when Apple began introducing its Retina displays to its products like the iPhone, iPad and iMac in 2010. These high density pixel displays are based on the concept of providing high-definition display that equals or exceeds the pixel density that can be distinguished by the retina of the human eye. 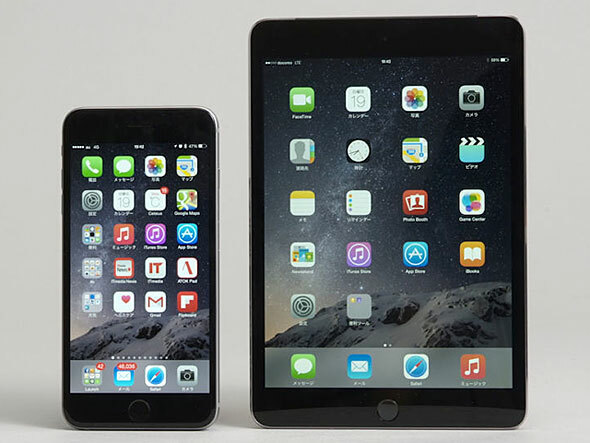 Pictured are the iPhone 6 Plus (left) and iPad mini 3 (right) which feature Apple's Retina display. Even looking closely at the screens, the pixels cannot be distinguished on the high-definition displays. When it comes to visual devices, looking at the actual display often has more impact than a long description. Following the entrance of the Retina display and its positive reception, various manufacturers introduced smartphones, tablets and PCs with high pixel density displays, so they have spread to regular users. Of course, products that are higher priced than the rest do not catch on, so the prices are coming down at the same time. The reason this is possible is complex and includes the improvement of LCD panel manufacturing technology, a substantial increase in the number of products adopting high pixel density LCD panels resulting in an environment conducive to economies of scale, and the rise of price competition between products featuring high pixel density LCD panels. In this way, the software and hardware environments to support HiDPI display were put together, and in response, display manufacturers began aggressively introducing 4K displays, and the momentum of super high pixel density displays has taken off all at once. The table below summarizes the specifications of high pixel density displays. The pixel densities of PC displays are lower than those of smartphones and tablets, but in the case of PCs, the user views them from a distance of about 50 centimeters, so the high-definition display appears just as smooth. As a rough guide, in the case of external displays for PCs, if the pixel pitch is less than around 0.2 mm, normal use becomes more difficult at normal magnification, so the magnification has to be increased with the scaling setting. PC displays are currently becoming more and more diverse, including the 4K and HiDPI trends introduced earlier. 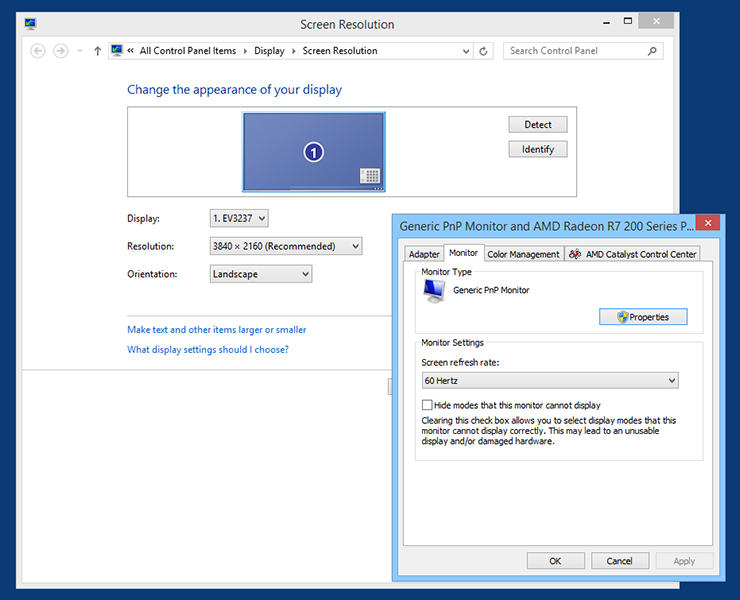 Let's summarize the screen size, resolution, pixel density and aspect ratio trends in current PC displays. Since the latter half of the 2000s, square screens with aspect ratios of 5:4 and 4:3 have been on the decline in the PC display market, while 16:9 and 16:10 wide screens have been on the rise and have become established. At the same time, there has been a transition from 17" and 19" square screens to 23" and 24" wide screens. There is also an active trend to move towards wide screens of 27" or more in pursuit of even more comfortable environments. That transition is split between those looking for a larger work space choosing 3840 x 2160 pixels (UHD 4K) or 2560 x 1440 pixels (WQHD) and those looking for a display with greater visibility at a lower price choosing 1920 x 1080 pixels (full HD). In recent years there have also been ultra-wide screen products hitting the shelves featuring even wider screens. These are products with super wide screens featuring aspect ratios of 21:9. They are not suited to those switching from environments with a single regular display, but there is replacement demand from business users that regularly use spreadsheets as well as those coming from side-by-side dual display environments. At the same time, going in a completely different direction, EIZO plans to launch its 26.5" FlexScan EV2730Q display featuring a square panel with an aspect ratio of 1:1 in spring 2015. It is a truly unique screen size, but it features a high resolution with full HD stretched horizontally to 1920 x 1920 pixels, so there is plenty of vertical and horizontal working space. Considering the large number of users that use two full HD displays side by side, it will be highly versatile. EIZO's 26.5" FlexScan EV2730Q LCD currently under development. Adopting a very rare square panel, the company is proposing novel uses. Today, with the emergence of 4K and other high pixel density displays and the breaking down of the concept that a high resolution (high pixel count) equals a large work space, there is still no change in the fact that screen size has a significant impact on work space. As a rough guide for choosing, comparing to paper sizes provides an easy understanding from the standpoint of work efficiency. The main paper sizes are shown in the table below, so check them against the display area for the above screen sizes. A3 (long grain) is a size allowing a crop mark to be placed on the outer edges of the A3 printing area as a mark for positioning for co mmercial printing or cutting, but there is no uniform standard, so sizes vary slightly depending on the paper. For example, the 23" full HD displays that are currently mainstream have a display area of around 509 mm x 287 mm, which holds one A4-sized sheet (297 mm x 210 mm) and leaves substantial surplus space. This is sufficient for web browsing and simple spreadsheets, but for displaying an A4 two-page spread in actual dimensions, it is lacking vertically. If using it for retouching photos to be printed on A4 two-page spreads or, in other words, A3 paper (420 mm x 297 mm), DTP, design work, etc., having an area where it can be displayed in the actual A3 dimensions and an area for the tool palette allows the work to proceed more smoothly while confirming what the final product will look like. For these conditions, the candidate displays will be 24" wide (approx. 531 mm x 299 mm) or larger. If you are envisioning something up to A3 (long grain; although not standard, around 483 mm x 329 mm), a 27" wide (approx. 582 mm x 364 mm) is slightly larger than that, so you can gauge the required screen size using paper size as a guide. 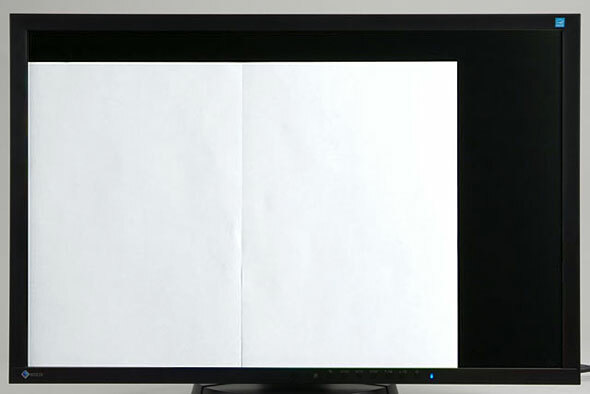 On a 24.1" wide LCD supporting 1920 x 1200 pixel display (WUXGA) with an aspect ratio of 16:10, you can display an A4 two-page spread or A3 size (420 mm x 297 mm) image at the actual size on a single screen and have the menu and tool palette on the outside. The photograph is of EIZO's FlexScan EV2436W. When choosing an LCD in the future, it will be necessary to also consider the pixel density resulting from the screen size and resolution combination. As previously stated, super high pixel density displays basically require magnification with scaling for use, so high resolution (high pixel count) does not equal a large work space. This is a key point that needs to be carefully noted. Thanks to the diversification of LCDs, users are able to be very choosy when selecting products based on their own uses, but the other side of the coin is that there is also an increased risk of accidentally purchasing a product that does not match your needs. In order to avoid the tragedy of purchasing a super high pixel density display in hopes of increasing the work space only to realize that magnification has to be used, which means that the work efficiency is the same as before, it's important to select the optimal model with a proper understanding of the features such as the advantage of super high pixel density displays when it comes to very high definition display and that going with a larger screen size is effective for increasing the work space.